The fight to stop the Pebble Mine goes on -- but the battlefront has moved from the U.S. EPA to the courtroom and beyond as we escalate massive nationwide pressure on Northern Dynasty Minerals, the last company standing behind the disastrous venture, to call it quits. Over the last two weeks, NRDC ran a series of hard-hitting, full-page print ads in Washington urging the Pebble Partnership -- Northern Dynasty's legal entity -- to walk away from Pebble Mine. 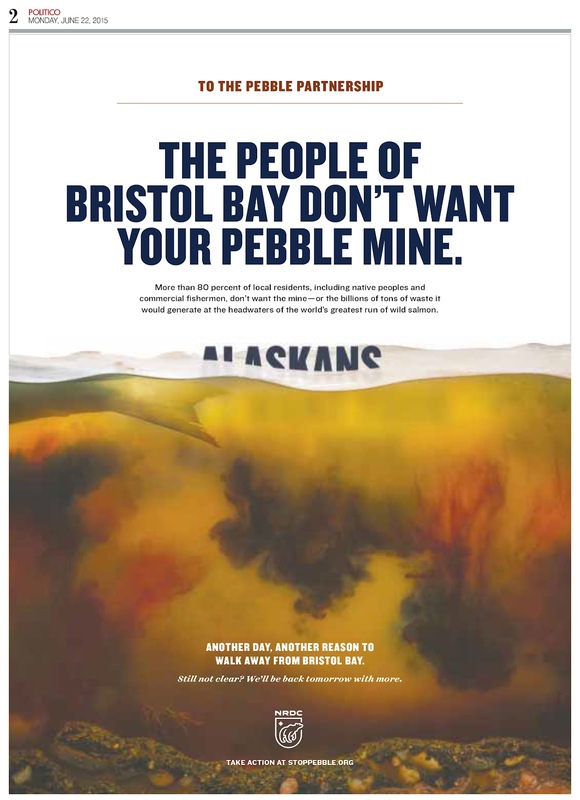 The EPA has confirmed that this gargantuan open-pit, gold and copper operation -- along with its estimated 10 billion tons of toxic mining waste -- carries catastrophic risk for Bristol Bay, its world-class salmon fishery, its pristine environment and its people.